*USA-Gymnastics--: For the first time since 2009, the United States is playing host to an International Gymnastics Federation World Cup event for acrobatic gymnastics. The "Vegas Acro Cup", slated for March 22-24 at the Rio Hotel, Casino and Convention Center in Las Vegas, Nev., includes a World Cup session on each of the three days. 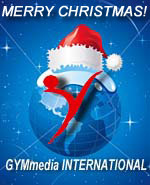 MERRY CHRISTMAS and a HAPPY & HEALTHY NEW YEAR! In the spring of 2018 Antwerp will host the 26th World Championships Acrobatic Gymnastics. The competitions will take place in the Antwerp Lotto Arena from 13 till 15 April 2018. * Women Pairs, * Men's Pairs, * Mixed Pairs, * Women's Groups & *Men's Groups.